David first started to play the piano at the age of seven, before progressing onto the electronic organ at eight years of age. He is an Associate and Licentiate member of the London Victoria College of Music as a pianist. He first played the theatre organ at thirteen years of age and has since played 123 Theatre Organs, including those at the Opera House and Tower Ballroom, Blackpool Wurlitzer. In 1983 he won the Scottish and ATOS “Young Theatre Organist of the Year” Competitions at East Kilbride and the former Granada Cinema, Harrow. In 1984 he was awarded the “Dean Herrick Memorial Trophy” for the ATOS competitor who achieved the most for the Theatre Organ cause, again at the former Granada Cinema, Harrow. David has broadcast on five local BBC local radio stations and has appeared three times on Welsh Television, as well as playing concerts for many electronic and theatre organ societies throughout the Country. He has also recorded seven commercial cassette tapes, each on a different theatre organ. David owns the ex Plaza Cinema, Crosby 3/10+Melotone Compton organ, which is installed in a converted farm building at Belper named ‘The Organ Loft’. It has comfortable seating for up to 60 people and David presents regular concerts and musical evenings at this venue. 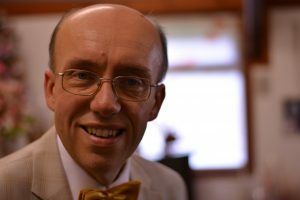 In 1999 he was appointed as the Vice-President of the Belper and District Organ and Keyboard Club and in 2010 he was also pleased to be offered the position as President of the Harworth Christie Organ Enthusiasts, succeeding the late Dr Arnold Loxam in this role. The Harworth Christie was one of the first theatre organs that David played and therefore he was particularly proud to be able to take on this role. When not playing theatre organs, David can be regularly found playing for local church services in his home town of Belper, Derbyshire. As well as being used as a solo instrument, he often plays the organ in an accompaniment role, particularly for accompanying singers.